Pipeline accidents are increasing nationally. 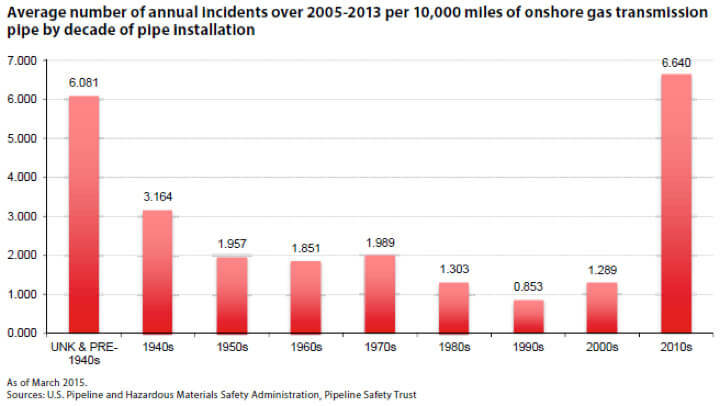 As shown below, the Pipeline Safety Trust’s analysis of the annual average number of incidents per 10,000 miles of onshore transmission lines found a spike in incidents for pipelines installed in the 2010’s. In April 2016, the Texas Eastern Transmission natural gas pipeline exploded in Salem Township, Pennsylvania. The fire burned roughly 40 acres of farmland, destroyed a home, and left one person with severe burns. Investigators from Spectra Energy, which operates the pipeline, as well as officials from the federal Pipeline and Hazardous Materials Safety Administration, still do not know the cause of the explosion. Spectra Energy has also proposed to build the PennEast pipeline that would connect to the Texas Eastern Transmission. A 2015 study by the National Transportation Safety Board was spurred by a series of major pipeline accidents in Florida, California, and West Virginia in the past five years. The explosions and fires killed eight, injured more than 50 and destroyed 41 homes. The report pointed out weaknesses in inspection plans and federal oversight of the pipelines. In 2005, contractors removing an underground storage tank at an apartment building in Bergenfield ruptured a distribution pipeline, setting off an explosion that destroyed the building and killed three. PSEG was again fined, along with the contractor. In 1994, a ruptured gas pipeline in Edison sent a fireball into the sky, destroying eight apartment buildings and injuring more than 100 residents. A federal investigation concluded that the line had likely been gouged several years before by excavation equipment and that metal fatigue increased a crack in the pipe. The accident was worsened because the pipeline owner, Texas Eastern Transmission Corp., couldn’t shut off the gas flow quickly, officials concluded. Does New Jersey Need More Pipelines?